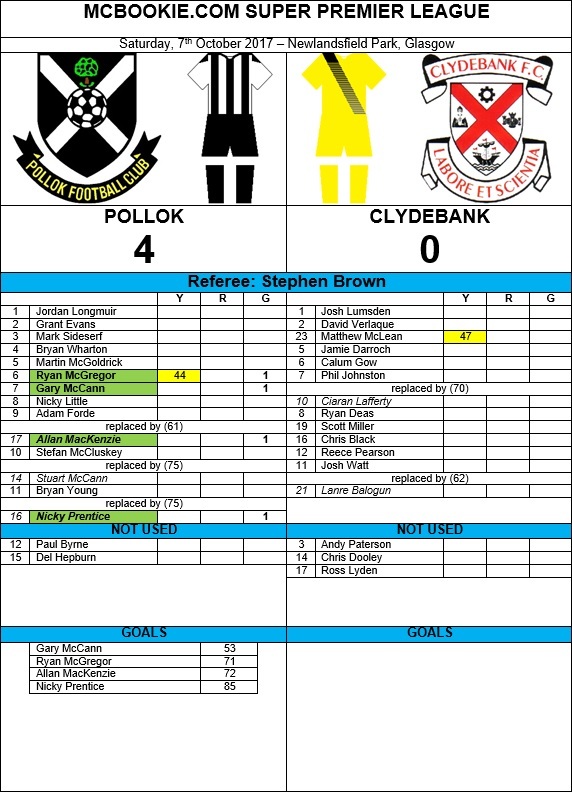 Four second half goals saw Pollok pick up their first home league victory of the season, defeating Clydebank 4-0 at Newlandsfield Park. The first half was a scrappy affair with little in the way of goalmouth action for either side, though Pollok goalkeeper Jordan Longmuir did have to be alert to tip a deflected cross over the crossbar. Thankfully the second half proved to be more entertaining fare, especially for those of a Pollok persuasion as they signalled their intent early, Stef McCluskey putting the ball in the net, but adjudged to be offside. The homesters broke the deadlock in the 53rd minute, Ryan McGregor’s ball out wide to Gary McCann seemed harmless enough, but the winger had different ideas. Cutting inside from the right wing he passed two Bankies’ defenders before firing a left foot shot into the top right-hand corner. Ryan McGregor turned from provider to scorer in the 71st minute, netting a header at the back post from Bryan Young’s flag-kick. It was 3-0 a minute later, Allan MacKenzie showing great skill on the left wing to burst through two defenders and charge for the bye-line, where he squeezed a shot from an acute angle through visiting custodian Josh Lumsden. Allan MacKenzie’s pressuring of the Clydebank rearguard paid off in the 85th minute, nicking the ball off a defender’s foot and into the path of a charging Nicky Prentice who showed great composure to complete the afternoon’s scoring. Today’s match referee is Stephen Brown (Cat 1D) from Glasgow. He took charge of the Renfrew game earlier in the season.